Have you guys had an acai (a-si-ee) bowl before? They are all the rage in California, I'm told. I was pretty late to the game on this food trend, having my first acai bowl just a couple months ago. We have one (ONE!) place you can get an acai bowl here in Charlotte and I don't even think you can call it a food truck. It's more of a food trailer? Food cart? Well that is where I had more first acai bowl and it was just okay. For $10 I expected it to be amazing. It wasn't. Then I was back in my hometown, San Diego, late last year and finally had a proper acai bowl. And it lived up to it's outrageous price. Yes, it is a glorified fruit bowl, but it's delicious, filling, and oh so good for you. So since I can't get a decent acai bowl around here, I decided to figure out a way to make my own at home. It's actually quite easy if you can get your hands on some acai puree. 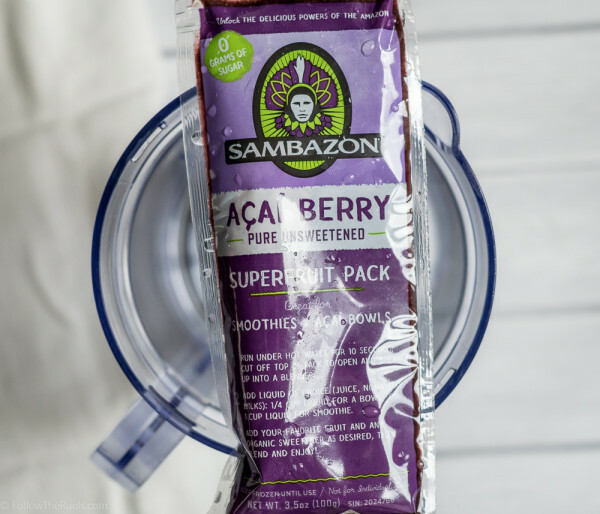 What you need to make your own acai bowl is this little packet of goodness - Sambozon Acai Berry pack. You can find this in the freezer section of your local Whole Foods, health food store, or Amazon (in bulk). I prefer the unsweetened packs, but they also sell sweetened packs, too. This next part is as easy as making a smoothie. I ran the packet under some warm water for a few seconds, then broke the frozen block of acai up into smaller pieces and dumped that into a blender. I added some almond milk and honey, then blended it until it formed a thick puree. Something about the same consistency as frozen yogurt. From here, you can make it your own. I personally like to add a little almond butter, lots of fruit, and a touch of granola. If I don't have fresh fruit, then I will toss on some frozen berries and banana slices. Chia pudding would also be good on an acai bowl. 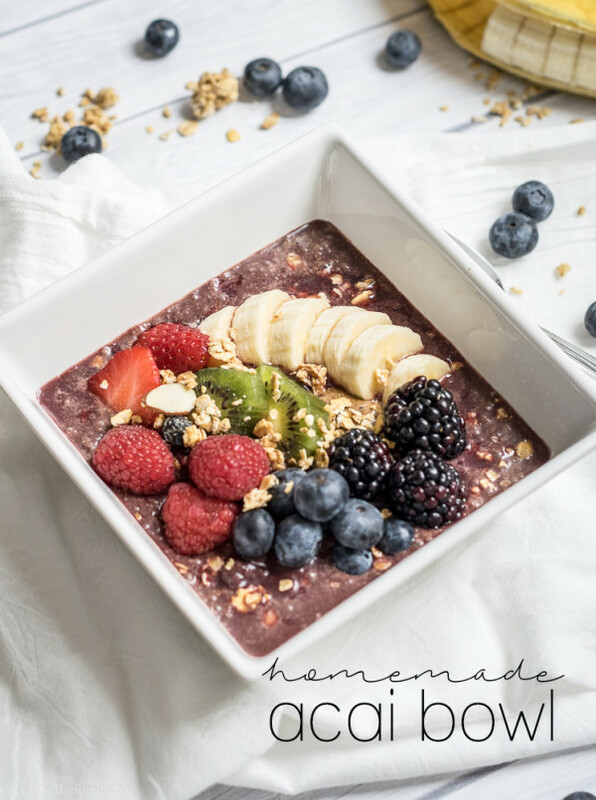 The best part about these acai bowls is that they are a part of any healthy and nutritious breakfast, but can also be a light lunch, post-workout snack, or dessert! I hope you give these a try! Or let me know what your favorite acai bowl toppings are! Top the blended acai with almond butter, banana, kiwi, berries, and granola. Other toppings that would be delicious are chia pudding, nutella, peanut butter, mango, pineapple, coconut shavings, nuts, and chocolate chips.